It had been quite a while since I took a good look at the condition of my 26" Echo Pure trial bike. I had noticed that the bolts were pretty rusted and some parts of the treads on the rear wheel tire were ripped off. I could see the tire's inner lining and reinforcement. Time for some major replacements. The replaced rusted bolts just waiting to cause pain... LOL. The new steel bolts on the front brake mounts. I changed all the bolts on both the front and rear brakes. Replaced the stem's bolts as well. Wished I had some titanium bolts instead of the steel bolts... LOL. Check out the tread on the rear tire. Ripped right off. Another angle of the tire to show the ripped section. While I was replacing all the bolts on the bike I noticed that one of the tube of the rear hydraulic brake was slightly dented. I adjusted and twisted the tube and it sprung a leak. I tried readjusting the pressure of the hydraulic fluid at the brake lever, but made it worse. Lets just say I had hydraulic fluid all over the floor! 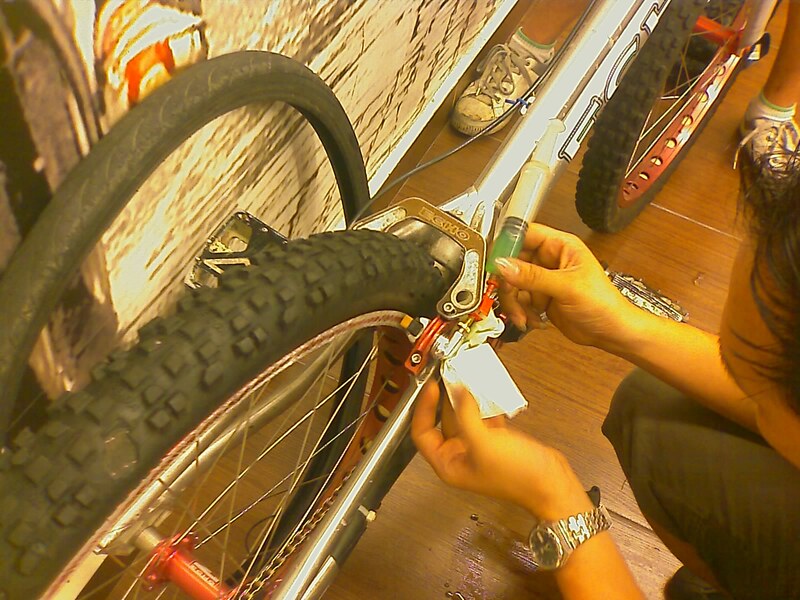 The screw on the brake lever to adjust the hydraulic pressure. Noticed that the screw had worn the gap in the lever. Sigh! The hydraulic brake fluid leaking from the tube. The next day, I took my bike to KSH bike shop in Taman Tun. Unfortunately, they were swarmed and could not help me out with the brakes. But they were kind enough to provide me with the tube and nozzle for topping up the hydraulic fluid (thanks guys!!). All I needed was the "injector" to connect to the tube. I was intended on heading home to try my hand at fixing and topping up the hydraulic fluids. But, somehow along the way, I side-tracked to Taman Megah and decided to stop at the Merida bike shop to get a new pair of tire. I ended up asking them to help top-up the hydraulic fluid. Took about 2 hours, but we managed to get it done. 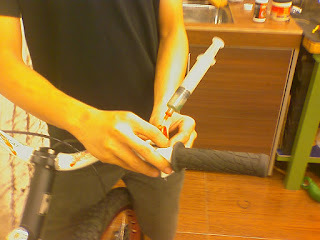 Bleeding the hydraulic fluid at Merida bike shop. Bleeding the brakes via the lever. The new Panaracer tire that I bought. The Panaracer tire in all its glory! I love the tire! Light and felt great to ride! The brakes worked great. The tire felt good. But I felt that I still needed a new set of rear brakes. And so I texted Walton in Singapore and ordered a set of Magura HS33 rear rim brake.